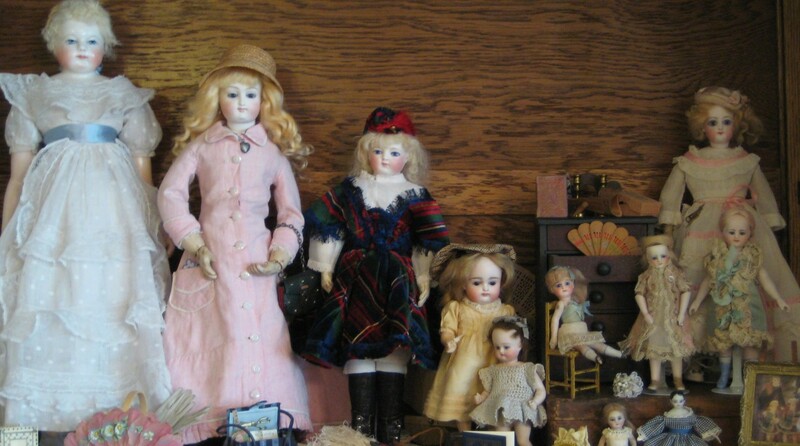 Home→German Bisque Dolls→Are All Happy Dolls Creepy?? Are All Happy Dolls Creepy?? When my son was in high school, one of his friends was disturbed by my dolls. He thought they were staring at him. This rare French Jumeau, in perfect condition, was sold by Theriault’s last Saturday for $250,000.00. Does anyone think she’s not creepy? She’s certainly not cute or pretty. I understand that for some collectors, rarity equals value. This doll is a museum-worthy curiosity. I also understand why early doll manufacturers usually chose more serene expressions for their dolls. Smiles in bisque often come across as grimaces. For me, I choose dolls that I want to look at. They are not always expensive, but they all talk to me. In a nice way. Here’s my smiling doll. He makes me smile. I don’t think he’s creepy. When I am surfing around antique doll boards on Pinterest, I come across his picture (also from Theriault’s) on many people’s boards. He’s a popular guy. He has wee banjo player as a companion. He is marked Germany over 162 3/0 on his bisque head. The only 162 mark I am familiar with is for a Kestner lady doll. He is not a Kestner lady doll. On his papier mache body, 6356 and a treble clef are marked in ink. I have no clue what that means. His arms and legs are composition. He stands 7 1/2″ (19cm) tall and the little doll is 3 1/4″ (8.5cm) tall. The big doll is wearing a yellow cotton flannel non-removable costume. As you can see in the back view, his pants are nailed on (ouch!). The little doll’s costume is made from cotton batting. His banjo is made from wood covered in paper. I don’t usually buy dolls that I cannot redress, but he spoke to me from the auction catalog and looking at him in my doll cabinet still makes me happy. Who could ask for more?